Gus J. Leotta III. M.D. Gus J Leotta III, MD is an Orthopedic Surgeon who subspecializes in sports medicine. He earned his undergraduate degree from M.I.T. in 1995 and his MD from the University of California San Francisco in 1999. He completed his Orthopedic Internship and the majority of his residency at Eisenhower Army Medical Center in Augusta, Georgia before deploying twice to Iraq as a battalion surgeon with the 1st Armored Division and as the medical director of detainee operations in the 101st Airborne, Division. 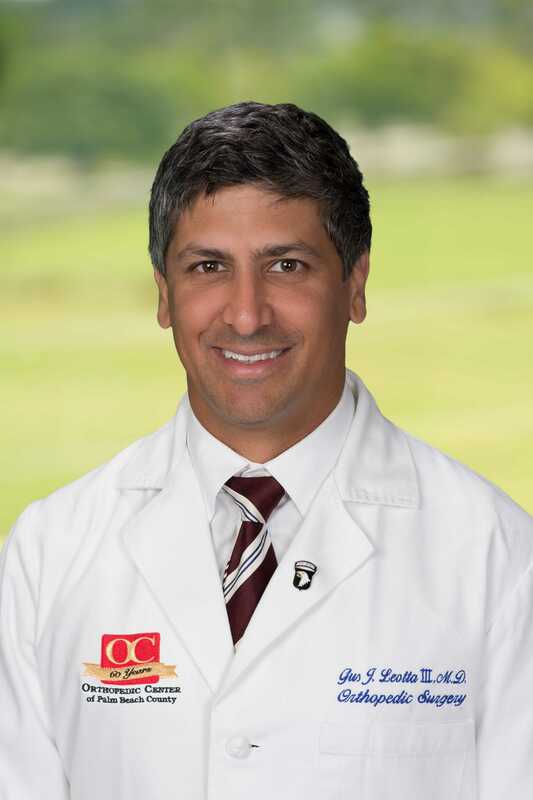 After completing his Army service at the rank of Major, Dr Leotta moved from his last duty station in Heidelberg, Germany to New York City where he completed his orthopedic residency at SUNY Downstate. Afterwards he completed a fellowship in sports medicine at UNZ Sports Medicine Institute in Coral Gables. There he was part FIU athletics and the Florida Panther NHL team serving as the team physician. He specializes in Knee, Shoulder, Hip Fractures and Trauma injuries.